Preheat oven to 350F. Toast the chopped pecans on a baking sheet in the oven for 6 to 8 minutes, or until fragrant. In a heavy saucepan, cook the butter, sugar, water, and salt over medium heat until the temperature reaches 305F (hard-crack stage), stirring occasionally (watch closely after it reaches 290F because the temperature will increase rapidly). When the mixture becomes dark golden brown, immediately remove the pan from the heat. Stir in the vanilla extract. Pour the mixture into the foil shell. It will spread but may not reach the edges of the square. Cool at room temperature for 45 minutes, or until hard. Melt the chocolate according to instructions on the side of package. 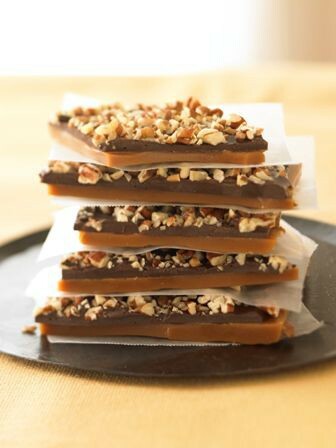 Spread melted chocolate over the cooled toffee, and sprinkle with the pecans, pressing lightly to set pecans into chocolate. Let set at room temperature 1 hour, or until the chocolate is set. Break toffee into pieces. Store covered at room temperature for up to 1 month.